Today, we wanted to have chicken rice for lunch and as recommended by some collegues, we decided to try out the famous Sin Kee chicken rice in Mei Ling market and food centre. We have problem finding this food centre as it is quite out of the way and sandwiched in between a multi-storey carpark and the surrounding HDB flats. The newly renovated food centre is very spacious and cooling, a good ambience for having lunch in a hot afternoon. Being new, it is also relatively clean. In my humble opinion, for a chicken rice to be rated as 5 star, it must have very good rice, chicken and chillie sauce. The rice serve by this stall is very fragrant and tasty. 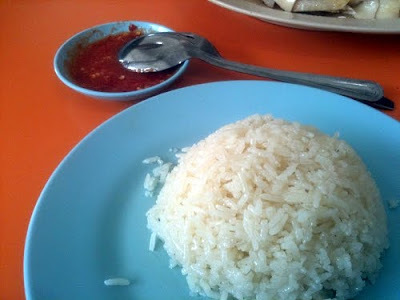 The rice is neither soggy or oily. You can literally see every single grains of rice yet the grains are neither too hard or too soft, just nice. 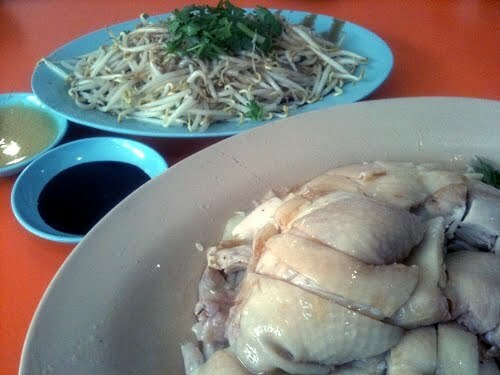 The chicken meat is juicy, not oily and tender with slices of cucumber placed beneath the chicken meat. Finally, the chillie sauce is a little bit sweet with a touch of vinegar and is definitely not hot. For those who prefer fiery hot chillie sauce, this will be disappointing but it is still up to standard compared to many other stalls. However, there's no soup, yes, you hear me right, no soup. Anyway, I'm not really keen about the soup. 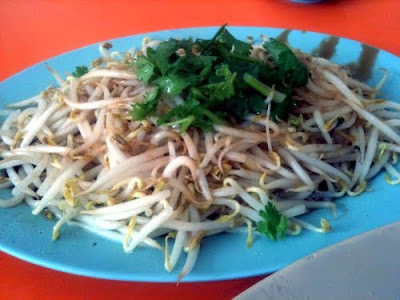 We also ordered a plate of beansprout. It is perfectly cooked and served with simple yet delicious sauce.